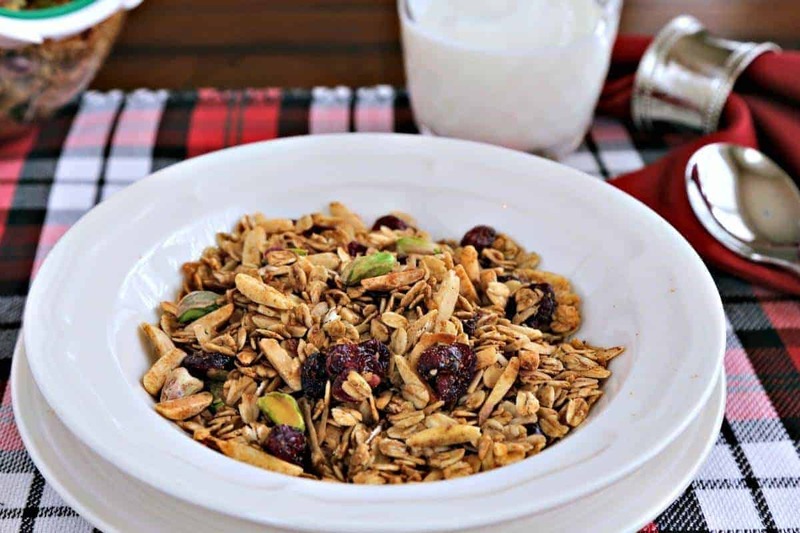 Sweetened with maple syrup and molasses, Ginger Spice Granola gets a nice crunch from toasted coconut and almonds and bakes in just 30 minutes! Do you ever find yourself in a rut when it comes to weekday breakfasts? Most mornings I’m grabbing a granola bar and cup of coffee, and if I’m lucky a piece of fruit, before heading out the door. Yes, believe it or not, this food blogger relies on convenience breakfast items (instant oatmeal, cereal, yogurt) during the week. Getting myself to work on time would never happen if I cooked a hot breakfast—that’s reserved for the weekend! But, I have to admit that sometimes I get a little tired of the same old thing. Although I don’t make time to cook on weekday mornings, I do like to break up my routine by baking homemade granola to eat instead of boxed cereal. 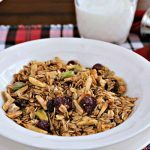 This recipe for Ginger Spice Granola comes together in just 30-40 minutes, and it makes enough to feed both John and I breakfast for a couple of weeks. It keeps fresh in an airtight container for two to three weeks and is delicious served with a little milk or as a topping for yogurt and fruit. Convenience breakfast doesn’t always have to come in a box. 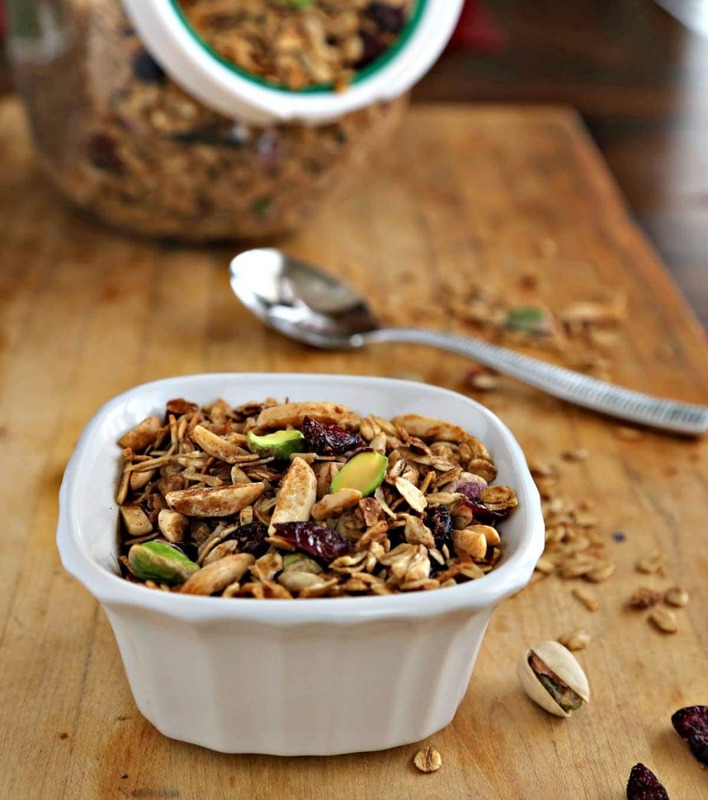 With just a little planning, baking homemade granola ahead of time gives our weekday mornings a little variety. This version has some of my favorite winter spices—cinnamon, ginger, and cloves—and is naturally sweetened with maple syrup and molasses. The pistachios and dried cranberries are added in after baking to prevent them from becoming too chewy. Feel free to mix things up a bit by adding or substituting your favorite nuts, like pecans or walnuts. 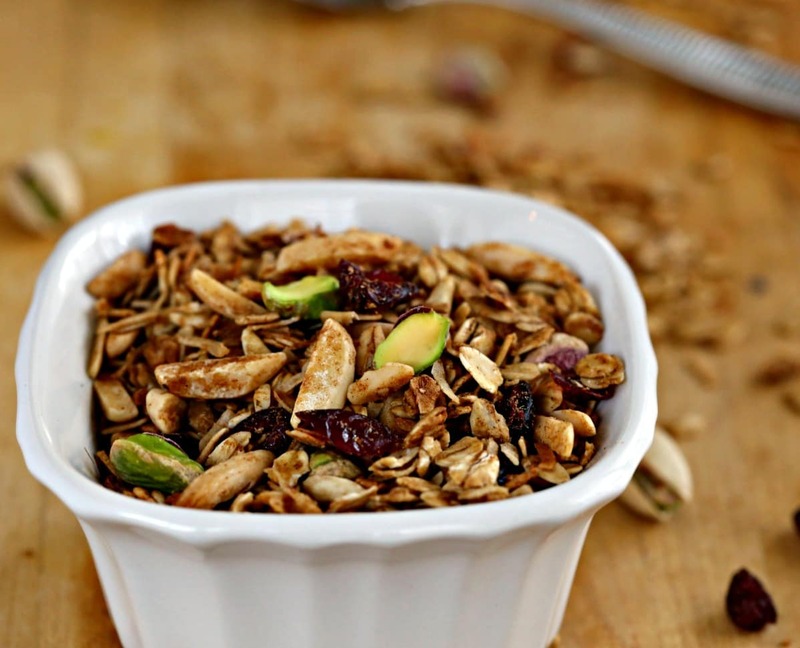 You can even turn this granola into a snack mix by adding chocolate chips or M&Ms. Enjoy, friends! In a large bowl, mix together the box of old-fashioned oats, coconut, almonds, ginger, cinnamon, nutmeg, salt, and cloves. In a small bowl, stir together melted butter, maple syrup, molasses, and vanilla. Pour over the oat mixture and stir until evenly coated.Pour mixture onto a rimmed baking sheet. Bake for 30 minutes or until golden brown, stirring every 10 minutes to prevent over browning of the granola the edges of the pan. Remove from oven and cool completely. Stir in pistachios and dried cranberries and store in an airtight container. Never seen granola with molasses before. A very creative twist for this time of the year!